Special free report on duplicate Outlook items shows how many duplicate items contained in the selected Microsoft Outlook folders. It does not delete or modify any data and therefore is absolutely safe to use. 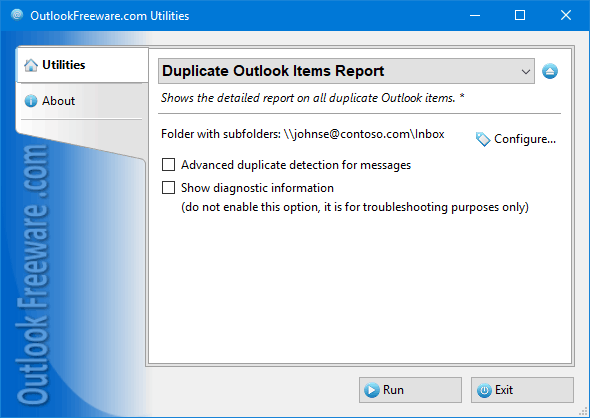 For cases where it is suspected that duplicate Outlook items are not identified as duplicates, there is a special diagnostic report for experts. It happens sometimes that the messages differ only by one recipient, one space in the subject, or one line in the body. Diagnostic report will help to know what the differences between these messages, or other elements of the Microsoft Outlook. The report shows the presence of duplicates in each of the selected folders or across all selected folders. There is also the ability to specify Outlook folders with high and low priorities. The report works for all duplicate MS Outlook items, such as contacts, messages, tasks, notes, calendar items and journal entries. User-friendly interface and constantly improving algorithm for finding duplicates do not require complex configuration to get the report. Easy-to-use Outlook add-in allows you to create the report right in your Outlook even for selected messages using the context menu. A standalone launcher application does not require running Outlook to create a report.